Miyazaki is the capital city of the Miyazaki Prefecture on the island of Kyushu in Japan. 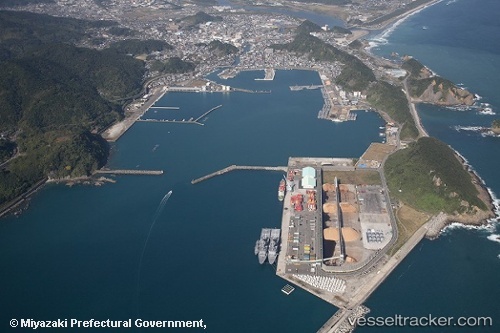 The city offers cruise ships a dock available at the Port of Aburatsu, which has a natural deep-water harbor facing the Pacific Ocean, and is located on the Nichinan Coast. Port improvements have recently been done to allow cruise ships up to 160,000 tons to berth. Located just about 1,000 kilometers from Taiwan and Shanghai, the port has seen calls from all three domestic Japanese cruise lines, and has also hosted the Legend of the Seas from Royal Caribbean. The Celebrity Millennium is expected in port later this year. Pierside, the city welcomes ships with folk songs, samurai dances and other local entertainment. A welcome center with interpreters is nearby to help passengers.